So are you checking out for some Chicken Legs/Kozhikkal. Do not get fooled by the name. Even though in Malayalam Kozhikkal means Checken Legs, there is no Chicken or any meat in this recipe. This is Malabar’s own snack known as Kozhikkal or Tapioca/Yuca Fritters . 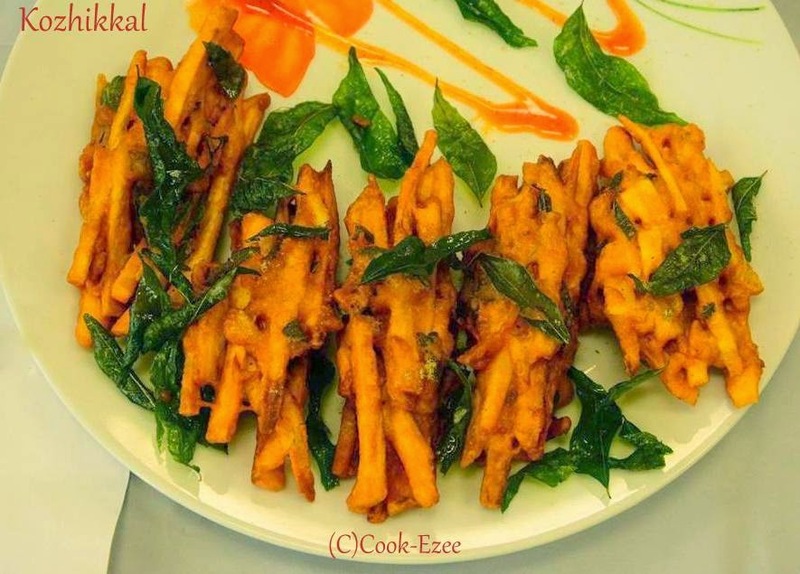 So here is the Recipe for this delicious Malabar Snack, Koyikkal Aka Kozhikkal aka Tapioca/Yuca Fritters, Enjoy!! Mix all the items under 'For the batter', by adding water to a consistency of dosa batter. Heat oil for deep frying, keep it in medium flame. Add a palm full of tapioca strips to the batter. Take less than a handful of the mixture, shape it in the form of chicken legs, and deep-fry it in oil. Drain the kozhikkal/tapioca fritters to a paper towel to drain any excess oil. Serve immediately with a Cup of Chai/tea! wow! koyikkal looks super delicious!! Cool recipe and easy to prepare!